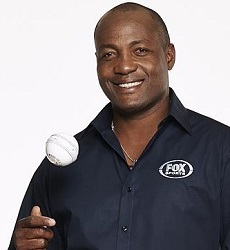 Former West Indian Superstar Brian Lara will join the commentary team at Fox Sports Australia for the upcoming ICC Cricket World Cup hosted in Australia and NZ. Fox Sports has assembled an extraordinary cast of former and current greats to lead its commentary team headlined by West Indian “Prince” Brian Lara, 1987 World Cup-winning Australia skipper Allan Border, colourful England star Kevin Pietersen, Mark Waugh, Damien Fleming, Brendon Julian and current Aussie stars Ryan Harris and Sunstar’s Ellyse Perry. Brian brings a wealth experience and insight to the panel, having played International Cricket for 17 years and scoring over 22,000 runs in the process. He is without doubt one of the all-time great batsmen. Sunstar secured the deal for Brian with Fox Sports and will act as his representatives during his stay for the World Cup and all commercial arrangements whilst in Australia. The tournament commences February 14 in Christchurch and concludes on March 29 at Melbourne.